MANCHESTER, NH – The Fortune 1000 company Connection, Inc. rose to the highest levels of corporate success in the US by helping businesses find innovative solutions to high-tech challenges. Early this February, the multi-billion-dollar company was itself the recipient of some astute outside-the-box assistance, when Events United helped it create a memorable setting for its annual kick-off meeting, despite the limited space and unusual room dimensions at the site where the event was held. The meeting, which was live streamed to Connection offices throughout the US, took place in the Armory, a venue in the Radisson Hotel near the corporation’s headquarters. Although the room presents some striking images with its steel beams and sloping ceilings, it also poses serious design obstacles for anyone hoping to create a professional lighting, video and audio presentation within its confines. 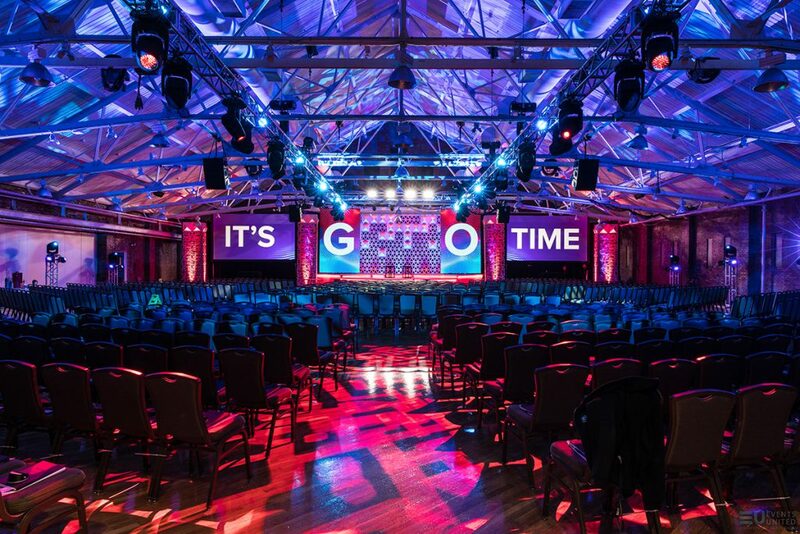 Events United met these challenges to create a stunning panorama at the kick-off event with a clever design plan, and help from over 100 CHAUVET Professional fixtures. Messina got around this impediment by coming up with a plan to place the set design, projection screens, and rigging elements up inside of the 14’ cavities between the steel to maximize height. However, to do this, he needed an accurate measurement of the room. Since there were no blueprints of the Armory, he and his head video engineer Jon Martell spent one week taking detailed measurements of the room and creating an accurate model in Vectorworks. Armed with this information, the Events United team went ahead with their design, which in addition to conforming to the dimensions of the room, accommodated a seating arrangement that called for positioning chairs in a chevron pattern. The end result was a multi-tiered stage positioned at a 45° angle to the room. To add depth to this stage, the Events United design team created custom acrylic panels that glowed when lit. 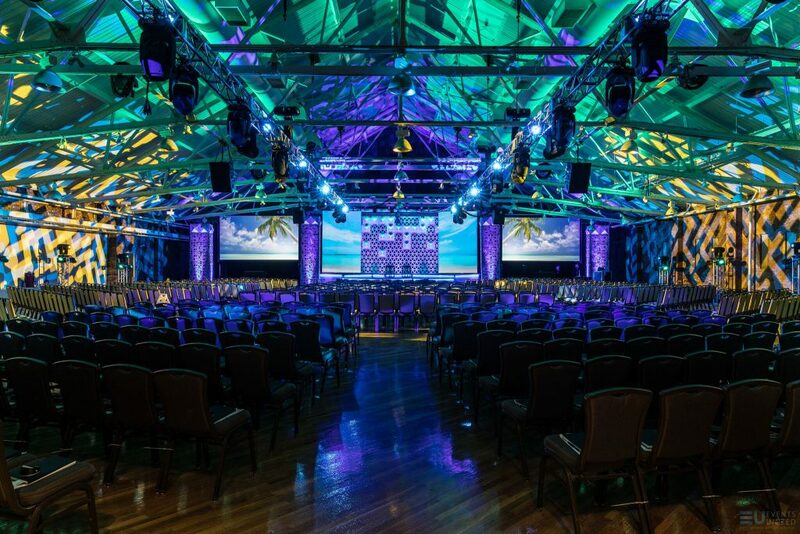 To turn the room’s roof into a vibrant design element, Events United positioned 10 Maverick MK2 Spot and 20 Rogue R1 Wash fixtures on 6’ truss uprights placed along the walls. These fixtures illuminated the highest sections of the roof, the spots providing texture and the washes adding extra color. The trussing itself was woven into the design with uplighting from COLORdash Par-Hex 4 fixtures. 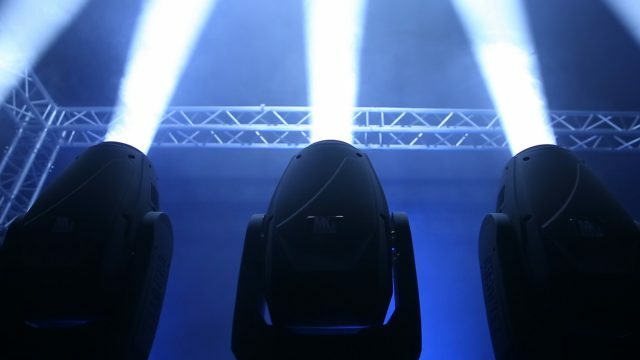 Lighting of the walls, floor and downstage area was provided by 12 Maverick MK1 Hybrid, 14 Maverick MK2 Spot and four Maverick MK2 Wash fixtures. These fixtures were flown on two 80’ trusses that flew over the audience. Like the truss structures along the walls, the two massive ceiling truss pieces were warmed by COLORdash Par-Hex 12 units. 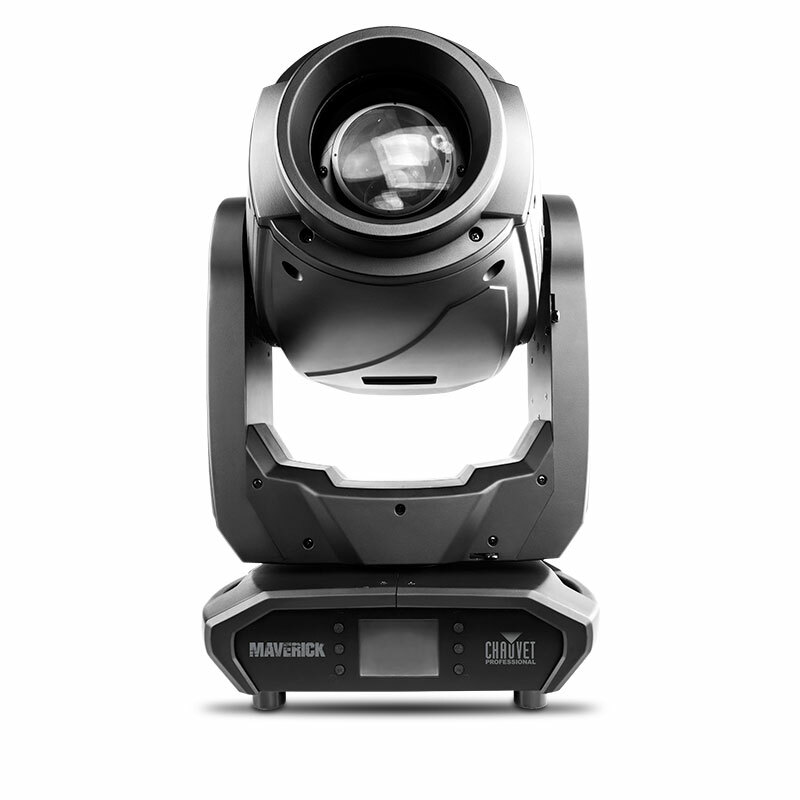 Events United illuminated the stage backdrop with eight COLORado 2 Solos and an equal number of COLORdash Batten-Quad 12 fixtures. Behind the backdrop, the team placed drape and mesh screens that were lit by six Rogue R1 Wash fixtures. An additional six Rogue units were used for hair light on the stage. 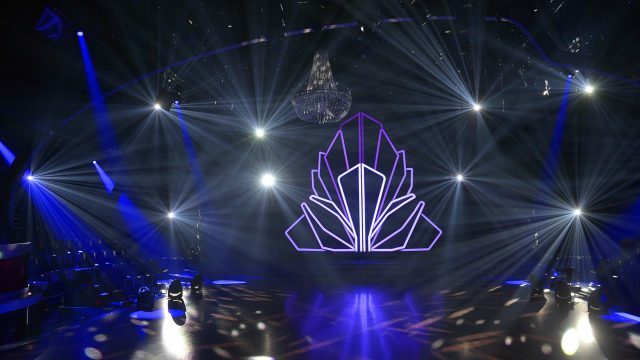 Livie’s design concept called for prominently featured video elements throughout the event with two 9’x16’ projection screens and two 8’x13’ portrait video walls (made of PVP X6IP LED panels) arranged across the stage. Jon Martell, Event United’s video designer, used Resolume Arena 6 on an iMac to map the content across the projection screens and video walls. Along with its immersive lighting and video displays, Events United also moved the crowd at the kick-off event with its audio design. “We designed the system with d&b audiotechnik speakers. Due to the low steel in the Armory, Chase Clark, FOH Audio Engineer, had to hang a main L/R array and a delay array about 75’ back,” said Donald Van Slyke, Events United’s head audio engineer. “We used Q1/Q7s for the main arrays, B2s for subs, T10s for front fills, as well as low profile E6s for stage monitors during the Q&A session. Chase used Smaart 8 to time align and tune the entire system in d&b R1 control software. Another very important part of the audio was the broadcast mix, since Connection was live streaming the event to their remote offices for live viewing, as well as archival recording for internal use. 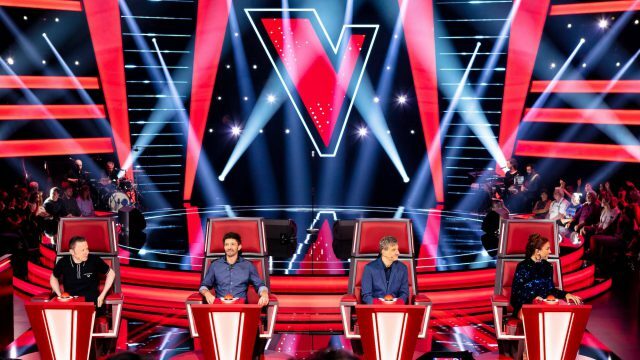 The company wanted people at the remote offices to feel as if they were in the room with the live audience. To create this feeling, Van Slyke deployed the Waves eMotion LV1 mixing system with DiGiGrid IOS and IOX interfaces.